LAFM TV Show! 13th Season! Episode 16 Now Available On YouTube! January 31, 2019	Comments Off on LAFM TV Show! 13th Season! Episode 16 Now Available On YouTube! Check out today's prep team spotlight on the Church Academy Crusaders! Check out today's prep team spotlight and recruiting update on the Benton Tigers! LAFM TV 13th Season! Episode 17! January 29, 2019	Comments Off on LAFM TV 13th Season! Episode 17! 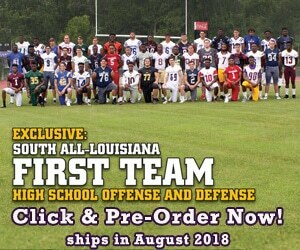 We have a great show this week with special guests Northwood High School Head Coach Jim Gatlin, Northwood junior quarterback Luke Bogan, Carencro senior quarterback Austen Breaux, new Sulphur High School Head Coach Cecil Thomas, and so much more! Click the link for more information! Check out today's prep team recruiting update on the Holy Cross Tigers! Check out today's prep team spotlight on the Barbe Buccaneers, which is a team that is coming off another successful season behind an explosive offense and a hard working senior class! Check out today's prep team spotlight on the Patterson Lumberjacks, who are trying to rebuild as a program under legendary Head Coach Don Jones. Even though the program did not have the year they expected, this is still a successful year in terms of sending its seniors to the next level! LAFM TV Show! 13th Season! Episode 15 Now Available On YouTube! January 23, 2019	Comments Off on LAFM TV Show! 13th Season! Episode 15 Now Available On YouTube! Check out today's prep team spotlight on the Booker T. Washington Lions! We catch up with Head Coach Tony Reliford as he recaps the 2018 season, talks about some of his seniors, and gives an early outlook on the 2019 season! LAFM TV 13th Season! Episode 16! January 23, 2019	Comments Off on LAFM TV 13th Season! Episode 16! We have a great show this week with special guests Ouachita Christian Head Coach Steven Fitzhugh, Dr. Kelly Ryder, Ruston senior linebacker Dylan Skinner, and so much more! Click the link for more information!